I can't believe that as you are reading this, I am already in Paris, but to get there, I had to figure out how I was going to pack 10 days worth of clothing and gear into a backpack under 21 pounds. My flight to Paris was only $383 round trip, not including my travel credit, but there was a catch. If you have ever flown Norwegian Airlines, you are aware of their baggage restrictions and extra add ons if you purchase the lower tier ticket. The catch: you can only bring a carry on under 10 kg (about 21 pounds), you don't get food on the flight, and you can't choose your seat. The flight is so cheap though that if you choose to add on a checked bag, the $45 fee each way still makes the flight cheaper than airlines such as Air France, but to me the baggage restrictions are a challenge I want to beat (also, I am just really cheap). You can also bring your own food onto the flight and who actually enjoys the icky airline food anyway? The last time I flew Norwegian it was summer and those clothes were much lighter. I knew this trip would be more of a challenge since not only are winter clothes heavier, they are also bulkier. My number one recommendation for travel to Europe is to use a backpacking backpack if you are able to fit all your stuff into it. These are the most convenient since it is difficult to pull your bags up and down stairs as well as roll your suitcase through the cobblestone streets. Most buildings in Paris, as well as the rest of Europe, don't offer an elevator option. If you read other blogs about traveling Europe, you may notice they will say the same thing about the stairs and streets — they aren't kidding. I didn't believe it the first time I went in high school and silly me thought rolling around a giant checked bag through the streets and up multiple flights of stairs wasn't going to be as bad as others said it would. It was and I ended up needing help to get my bag up the stairs after only making it up one flight. After scouring the internet for the perfect backpack, I came across the Osprey Porter 46. What stood out to me most about this backpack was that it opened from the front rather than the top. I talked to a few friends and they recommended a front opening backpack rather than a tradition camping top opening backpack. The backpacks that open more like a suitcase allow you to see everything in your bag rather than having to pull everything out to find what you are looking for. Another aspect that stood out to me was the laptop sleeve. As a photographer, I almost always have my laptop with me and I want to ensure it would receive maximum protection in my backpack. If you are on the lookout for a backpack, before purchasing it online, go to your nearest REI store and try out the pack. Make sure when it straps around your waist it is comfortable and doesn't dig into your sides. REI actually has weights they can put in your backpack to make sure it fits right when heavy and full. Walk around and check to see if the backpack won't be too big for you. Lastly, make sure the pack you are buying is within standard airline sizes. The Porter 46 fits perfectly within European carry on sizes, which is actually smaller than the American standard. Since sweaters take up so much room, I decided to use my travel Space Bags to squish all the air out of them and maximize my space. When I took these pictures I originally placed my clothes into two medium sized Space Bags and then my underwear and socks into a smaller Space Bag. My biggest for this trip so far is to buy name brand Space Bags. I purchased some new smaller, ones at TJ Maxx since mine were in storage, but after unpacking the bags for photos and then repacking them, the air wouldn't hold anymore. So it was back to square one and I had to use some larger Space Bags I had on hand already. My backpack is a little tighter on space now, but it will have to work. If wanting to purchase Space Bags, I recommend ones made by Ziploc rather than an off brand. After looking at this photo, I can't believe I managed to get all these clothes into one bag! I packed 6 sweaters, two turtlenecks, two undershirts, one pair of leggings, one pajama shirt, two pairs of jeans, one down jacket, one pair of shoes, and two coats. On the flight, I plan on wearing the heaviest items from that list which includes a sweater, jeans, an undershirt, and a coat. You may notice I don't have enough clothes for the entire duration of my trip. The reason being, you can always wear items again and laundromats exist if clothes need washing. It's winter and 40 degrees in Paris, so I don't think I will find myself sweating, ruining my clean clothes. I didn't picture my socks and underwear since no one wants to see that, but I packed 5 thick winter socks, 5 thinner socks, 10 pairs of underwear, one pair of fleece leggings, and one pair of tights for layering. 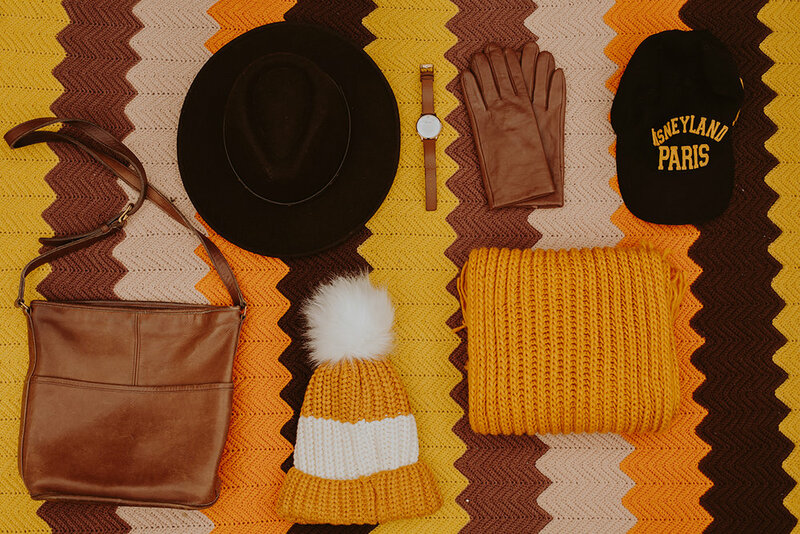 I have included these accessories in my bag to not only keep me warm, but also help mix up my outfits since I have less clothes than days I will be traveling. I have three different hats, a warm pair of gloves, one purse, one watch, and a scarf. From this list, I will wear the brown hat and watch on the flight as well as use the purse as my one personal item aside from my carry on. Now for the rest of my stuff. I love my backpack because the main compartment also features pockets along the sides where I can slide all my knick knacks and such so they aren't loose in my bag. Of course I will be bringing my camera, a battery charger, and my all-time favorite 50mm 1.4 lens. As for beauty items, I have my makeup bag that includes the basics of mascara, foundation, translucent powder, eyeliner, and concealer as well as my Naked palette, which I can't live without, and my trusty red lip stain. I also always travel with a pack of makeup wipes since they are perfect to use on the flight, nights where you are too lazy to wash your face, and they are just less messy than liquid makeup remover. The Neutrogena Makeup Remover Cleansing Wipes are my favorite. I also included one face mask since my face despises airplanes and tends to break out the second I step foot on my flight. If you think you may be starting your period on your trip, then I recommend bringing a few tampons and pads since European feminine products are nowhere near as good as American ones. I always pack a few just in case I need them or a friend. I can't count how many trips I have been on where at least one friend needed it. I am a huge fan of the Tangle Teaser hairbrush since it is so gentle on your hair and is the perfect size for traveling. I always pack some medication, which includes Motrin, Excedrin, Tums, Zzzquil, my allergy medicine, and my stomach medicine. I also pack some DayQuil, NyQuil, and Emergen-C in case myself or a friend gets sick. I have two small books, my journal, eye mask, and a down travel blanket to round out this list. As for my toiletries, I keep it pretty simple. Toothpaste, face wash, conditioner, body wash, perfume, shampoo, dry shampoo, and moisturizer. If I am running tight on my overall bag weight, I also have the option of leaving some of these items at home and purchasing my toiletries at my destination since this bag can weigh at least a couple pounds. I also recommend using a quart bag that has a zipper since they are much stronger. I usually pack a couple more in case myself or a friend needs an extra. Europe is much stricter on the liquid restrictions, so make sure you follow the 3 oz rule and put all liquids into a clear quart size bag. Unlike the states, specifically LAX, they will make you pull out your liquid bag. I don't bother with the reusable liquid bags since they always fall apart on me after one trip. The single use are pretty strong and I find they actually last quite a few trips. And that is all that is in my bag for this trip. I can't believe I managed to fit it all into one bag and it all weighed in around 17 pounds — I consider this one a success.